…Smooth Riding #75, Melting Pot Americans, and Bumpin’ Gresham. Read all about it! Read all about it! I’ve been digging through tons of history on streetcars, specifically Portland’s, light rail, ridership numbers, and more. To put some of this mess together I figured I would head out to my thinking place. If you’ve read my past entries, you know that is pretty much any transit vehicle to somewhere. Something about traveling and thinking, working and seeing, all this while the world goes by just makes things that much more. With that I was out the door and bound for some random adventures. First I jumped the #9 east bound. When I boarded the bus it was an intriguing smell of pot, lots and lots of pot heads on the bus. I honestly don’t think I had seen such a concentration of pot heads on the bus ever. There must have been 14 people all in the rear of the bus, reeking of pot. Not that this bothered me, I find the smell much more pleasant than a rank nasty cigarette any day. At 36th, or maybe it was 37th, the pot cloud floated off the bus, along with a few others. The entire slew of hot young ladies that happened to be on the bus then got off just past 39th. At that point the bus had gone from all seats filled and standing room only, to only about 15 people left on the bus. This however, is what usually happens on the #9 during non-commuting hours. Then around 82nd we bulked our rider count right back up to about 30+. This bus, needless to say, is a high rider count, efficient, timely, well scheduled, rocking bus route. The #9 Melting Pot. If there was ever a bus route that really showed America at it’s finest, the #9 is definitely that route. With Spanish, Mexicans, Portuguese, German, African Americans, Africans, Vietnamese, Chinese, Japanese, French, and even some Indians and American Indians riding at any particular time one can really get a cross section view of this nation’s people. For most white people its probably scary, since so many still don’t know squat about the other 50% or so of our population, but I find it rather endearing. At any particular time I’ve seen someone from the nationalities or continents I mentioned, and I’ve talked to more than half of them. When it comes down to it, all of these immigrants are the only thing that keep this country together. In all honesty the 3rd and 4th generation Americans have really gone to crap for discipline, seeking opportunity, and other positive traits. 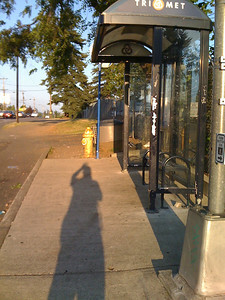 At 98th & Powell the ride ended, I had not checked and ended up on a bus that only went that far, my intention was to go all the way to Gresham. Oh well, I jumped off and took a good view in of the Powell Street Garage. A rather large place, with a pleasant enough and plain entrance. I walked out front to the bus stop, and checked the bus time. 9 minutes, I pulled the laptop out and finished up a paragraph and a unit test for the application I’m building. The sun was blinding in the west, which was making it impossible to see down Powell for the approaching bus. With the laptop out I got a little paranoid I’d miss it, especially with a bus coming into Powell Garage ever minute or so. I stowed the laptop away again and prepared for the bus’s imminent arrival. Leg two of the trip started on a bus that was packed full. We had at least 2 standees already, however I immediately was able to catch a spot in the back of the bus. I plopped myself in that corner and started hacking away. The driver was on the horn calling in a missing something another. She had a friendly repertoire with the lady missing the item and continued driving. As we rode past the skate park I couldn’t help but notice about 50+ kids out riding, skating, and generally shredding the park. To me that’s awesome, as I spent most of my youth and am again working toward riding some vert & at least street again. If you aren’t aware of what vert or “street” is kit Google for some searches on BMX, Freestyle, and Bicycles. You’ll be able to dig up some cool stuff. Same for Youtube, there are a ton of videos of people ripping it up with tricks and such. We rolled through 122nd and there where still more people out on BMX & Freestyle bikes. I’m not talking about the piddly kids bikes you pick up at Wally World, I’m talking about reinforced, niche bikes that are built like tanks. Seriously, you could drive into one of these bikes long ways with a Hummer, and the Hummer would probably be the worse for it. The driver made good time, as it is with the #9 this far out in the east side burbs’. We rolled through some of the apartment complexes and picked up a few dozen and dropped off a few dozen riders. I can’t help but feel the Bell Curve hitting hard in this part of Portland. Which of course is evident at every turn. Less educated, less income, simpler lives. No problem with that, just observing. It is an interesting phenomena among humanity that this curve, no matter what political system, no matter what period of history, no matter of slavery or barbarians, no matter of wealth redistribution or pure capitalistic behavior, nothing saves the poorer. They are always there, as timeless as humanity itself. 174th approached and the rider count dropped to 10 people. This last stretch is probably the least efficient, yet simplest part of the route. With what amounts to an almost straight shot down a 4 lane highway, the speed increases significantly. There are limited lights and limited turnouts along this part of the route, thoroughly planted in the middle of suburbia, and I suppose somewhere the Urban Growth Boundary. 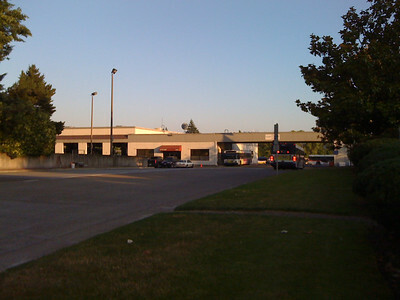 Downtown Gresham is completely different than most parts of the area. It’s classy, Small Town America. It draws a stark contrast to the area surrounding. With quaint shops lining the main street through downtown, leading toward Gresham Transit Center. Immediately at Gresham Transit Center the town goes to crap. Then there is a fairly decent open air strip mall and a few other little parts, and then it falls right back into crap again. The City of Gresham, really is bipolar. Bipolar-ness aside, the old town in Gresham is pretty sweet. 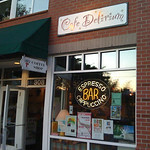 There are numerous places to eat, have a beer, or stop for a coffee. I don’t know Gresham so maybe not. While walking through the strip of old town I walked by this shop called Gnomshop, which is a skater shop for kids. They had a half pipe inside the shop! Shredding the pipe was about 6 little kids, it was awesome! I was very envious I didn’t have something as cool to shred when I was young. We where lucky to have dirt hills to jump back in Mississippi, brutal that was. A few other shots of Old Town Gresham for your viewing pleasure. 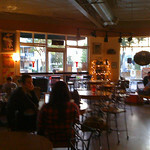 Wildwood Cafe has a great menu & good prices, looks like a worthy return trip to grab a bite there sometime. 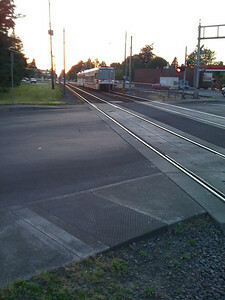 After my stroll through old town I boarded the MAX Blue Line at Gresham City Hall. Within 20 seconds there was the prospect of domestic violence between some immature, ignorant ghetto kid and a girl with her kid. It was simply, classic Gresham reputation. I couldn’t have asked for that to happen for the stereotypes to come pouring into my brain. But whatever, adventure I was after and that was a slight dose of such. Of course, not really very entertaining, knowing if he got physical I’d probably… anyway, back to the journey. The train made a clean run toward each stop, boarding people at each stop, quickly exceeding the rider count on the #9 on the way toward Portland. By 122nd Avenue we had at least 20+ people in this car, which probably gave us about 20ish in the trailing LRV. the sun set in the western skyline, leaving a beautiful purple, red, orange ,and whitish blue sky for us passengers to watch as the train cruised progressively toward downtown. After the initial idiocy of an almost domestic disturbance, the MAX fell almost silent except for the hum of the traction motors and the headphones playing ever so slightly. By the time we pulled into Gateway TC we almost had no sun on the horizon. I pondered transferring and making a run out to the airport, but decided against it as we pulled into the transit center. I went back to a bit of coding, giving a slight glance to do an estimate of ridership. At Hollywood I jumped off and decided I would make a go at transferring to the next #75 south bound. I had checked via Transit Tracker on the IPhone and looked like I’d have a tolerable 2-3 minute transfer. I had thought I’d go downtown and hit up Backspace, but I was intent on getting a bit more code written, and for that I needed faster Internet access. For that, homeward bound I needed to head. 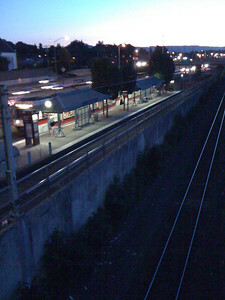 At Hollywood I grabbed a few shots, as shown here of the sun setting and of the light rail station stop. Kind of a ratty shot, but one can’t expect too much from an IPhone eh! The #75 arrived precisely in that 2-3 minute GPS estimate I received via Transit Tracker. Without a skip the bus, with about a dozen of us TriMet Rider’s we were off to the south on 39th Avenue. This part of my trip was over in what seemed to be the blink of an eye. I deboarded (is that a word?) at 39th and Powell and grabbed a few bits of grub for dinner at the Safeway. Back out to the street for the #9 for that final stretch home. Good run, interesting adventure, and as always a strange and realistic peak into the real America. I often complain that the streetcar did NOT get the X Billions of dollars spent in the Pearl. That was because of the tax abatements, which even continue today and will via extensions, etcetera. But what advantages do I know the streetcar to really have? Legitimate Reason #1: It’s stuck on the tracks, so it builds confidence along the line for developers. This is true, you can go and ask a number of the individuals that are responsible for starting businesses along the line. It offers longevity and a feeling of safety and comfort along the line too. Along routes where buses are businesses often have fewer people out on the street near the line, near a streetcar though people don’t feel bothered by its presence like they do buses. Does this counter my argument that the streetcar didn’t contribute significantly to the X billion? No, because the X billions that where invested in the Pearl where mostly large scale developer money, which as I said before was primarily based or the organizations, structure and liveliness of the city, and of course the ability to sell units the abatements that removed the punishment doled out to residents via the excessive property/home taxes. Legitimate Reason #2: The streetcar is consistent. People know what it is, what it does, and obviously where it goes. Bus routes change regularly and disparage riders. I’ve run in to no less than 3 individuals who asked me where a bus stop is on 3rd or 4th, to which I had to explain that the buses don’t run on 3rd or 4th anymore but on 5th and 6th now. Those stops of course, don’t even remotely resemble what was there on the mall before, or even reflect what was on 3rd and 4th. Even though it seems like a negative to have a consistent, unmovable route, it actually has this and the aforementioned benefit. In turn for the “sometimes rider” from the suburbs this adds comfort to the rider. This is one reason for games, events, and other such things in downtown Portland, millions of rides a year are taken on MAX or Streetcar that otherwise wouldn’t have been made into downtown. The money that these riders bring into downtown, and to the city in general, equates to millions per year and hundreds of jobs. Otherwise this money would have probably went to X-Boxes or other trite entertainment with 90% of the money going out of the United States. Legitimate Reason #3: This reason does NOT apply to Portland’s Streetcar. Portland’s streetcar is outrageously expensive. 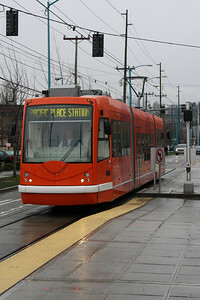 However, most streetcars are NOT even remotely as expensive as Portland’s. Often they’re about 2-3x more expensive than a 40’ bus. This leads most streetcar systems to be 10-30% cheaper than a comparable bus line. If you don’t believe me, I’ll have the math coming very soon. Currently I’m working the math out for light rail, which is a no brainer when looking at any long term transit strategy for a high throughput corridor. Over the next 15-20 years of streetcar operations in Memphis, Little Rock, and other places the streetcars will actually end up being LESS expensive then comparable bus service. In San Francisco and some other larger cities around the world, where streetcars have continued running for over 100 years, they’re already absurdly cheap. In New Orleans the original St Charles line, even with hurricane repair included, is easily 30% cheaper than what bus service would cost for the same ridership numbers along that line. Don’t even get me started on San Francisco’s lines, especially the cable cars, which pretty much under most logical accounting rules actually make a profit, but can’t say so because they operate under a non-profit accord for the city. Legitimate Reason #4: Electric Streetcars, just like electric vehicles of any type that run from catenary, are really easy to maintain. An electrical motor and system is far less complex than a complex diesel engine. Diesel engines are generally less reliable, more prone to issues during snow, heat, and other extreme conditions. Electric engines are awesome for reliability. In addition to reliability they’re also very powerful, often more powerful than diesel engines. Legitimate Reason #5: This reason is dumb, absolutely stupid, but it is a legitimate reason why streetcars have an advantage over many modes. Matter of fact, I don’t event like this reason, but here it is anyway. People LOVE streetcars. Not for any logical reason, they just do. Most people that LOVE streetcars do not have any reason they can verbalize or write down, that has a logical basis. It might be a temporary thing, it might be a long term feeling, it might only be a myth among urbanites. Whatever the case, fact is, the majority of people will get on a streetcar and sometimes even ride about for hours, long before they’d do the same on other modes of transport. This plays to a much easier time of gaining political support for getting them built out. Of course, there are some really loud naysayers, but the pro-streetcar people are actually louder these days, and thus win out. Legitimate Reason #6: They last forever. New Orleans runs streetcars that have had basic maintenance and a revamp or two, that where originally built in the late 1800’s. Streetcars are especially easy to keep up over a long period of time. 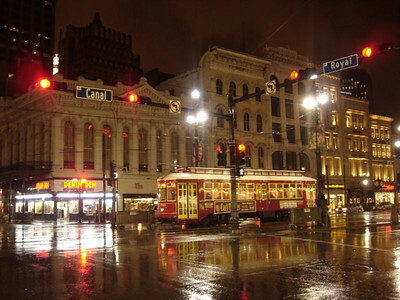 New Orleans is a prime example, a city which has been through hell and back multiple times, has managed to keep up multiple streetcar units that are over 100 years old. 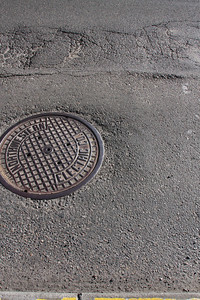 There is no reason that these ever really need replaced, as with maintenance and appropriate piece part replacement, can last forever in an economic, environmental, and usability context. Many other vehicles eventually just get thrown away and replaced beccause it is more expensive to maintain then to buy new. This is not the case with Streetcars. Streetcars are more like a building, one doesn’t just tear down a building or a home every few years. Instead a remodel, a repaint, or a simple rewiring and then back to the route. This type of service does not bode well for buses and most rubber on road based transport. So everyone keep reading and stay tuned for the top reasons transit rocks, more to come. "Increased service can only happen by EXPANDING coverage to outlining areas." No, that isn’t true. Some of the largest increases, at the lowest costs, occur right in the urban area of Portland itself. Just look at the ridership statistics available. The only bus line that runs at an operational profit is the #72, which SHOWS that the existing areas can receive increased service and not cost much additional money. Only problem now, is the #72 is basically at peak service. Even articulateds aren’t going to help much at this point, they simply need to put BRT or LRT down somewhere or somehow along that route. The Green Line, however might take a ton of traffic from the #72, if so that would alleviate a lot of issues. For one thing, the Green Line will be vastly faster than the #72. But overall, the idea isn’t to sprawl further and attempt to service that area (which is vastly expensive to the city & TriMet). The idea is the build up and increase service along existing corridors. It is much cheaper and more efficient. -not subject to track disruptions"
…and costs about 10-20% higher than light rail (including light rail capital and excluding road costs for buses) after a period of 20+ years. After 30 years and inflation it approaches even greater returns as the equipment costs are vastly less expensive at this point. Buses don’t even last that long, so the second 15 years of a bus line in operation along a route effectively, and needlessly doubles, because of the need to replace buses. The "0 needs to be spent" is 100% erroneous. Buses don’t drive themselves. A route that last more than 20 years, the most expensive part of that route becomes THE PERSONEL needed to run it. i.e. the driver, repairmen, maintenance, etc. So really, if we’re going to talk about costs as an end result – we should talk about replacing the necessity to have so much staff. JAX, Vancouver BS & some other cities run automated systems which are VASTLY cheaper than any human operated line hands down. "These arguments always get to the point that it is CHEAPER to operate the rail than the bus,"
Yes, they do. It’s all written down in the accounting costs. "WHEN YOU DON’T INCLUDE THE COST TO PUT THEM IN!" 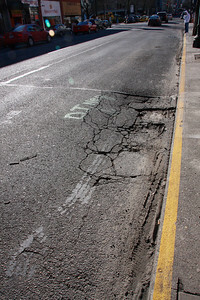 If we included the damage that buses do to the roads, there isn’t really much point to run them. We ought to run large "vans" to transport people instead, they do vastly less damage to the road and the roads would literally last many years longer WITHOUT bus service on them. We start adding the other costs, like the additional staff it takes to keep a bus service going, the maintenance staff, etc, it gets even worse. This is one of the reasons light rail has become popular. Especially as road budgets dry up even more, Departments of Transportation love the idea of removing some of their funding responsibilities. Either way, as you said, the taxes come out of our pockets. I’d rather buy rail any day than more roads. For environmental, economic, and life choices. "The cost to put this stuff in MUST be considered in any serious discussion on cost." I agree. So let’s include the road costs and maintenance for bus routes. (How about not, because that even further invalidates the reason to have buses). "It’s clear what the HONCHOS WANT, and its not bus service." That’s part of what I’ve been trying to get across. Some people like bus service, the people that VOTE and pay for this stuff want light rail and trains. Especially in the Portland area. That’s why we keep getting more of it. Aside from the fact that the Blue Line is absurdly cheap now in overall costs. The vehicles cost originally about 2x what a bus does now, except many of the buses bought around the same time are in desperate need of replacement while the LRVs are just starting their second leg of life. In addition, that equates to an LRV costing almost the same as a single 40’ bus over the long term, but providing transport for more than 2x what a bus carries. In effect they’re "free" now, as they’ve been paid for already, but we’re still buying buses because we can’t keep the old ones on the road (nor some of the new ones). Temporary Transit Mall, and Now What? The new transit mall is in use and it is a beautiful stretch through the city. 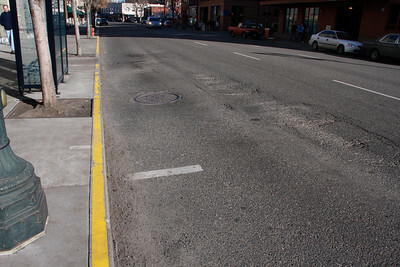 Now 3rd and 4th have been returned to their previous use as non-transit streets. The one major difference though is the quality of the street. It is now crap. 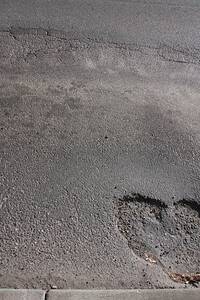 There are dozens of ruts, ridges, pot holes, fills, cracked cement, black top, and other destroyed sections of the street that where in good shape 2 years ago. All of this damage is bus specific damage. My question is, what are the city’s plans to fix this? Is it budgeted? Have they even planned for it? Will it be TriMet’s burden? Is it ODOT’s burden? In the end, it will of course come out of the taxpayer’s pockets, but that is moot as an assumed point. I want to know when it will be fixed. This is one of my ongoing comments about the approach to bus service (I know Erik Halstead has input on this in a number of ways) in the Portland area. TriMet needs to team with ODOT & the city to make it a HIGH PRIORITY to build primary arterials that buses travel on at a higher quality than mere black top as most of 3rd and 4th are. 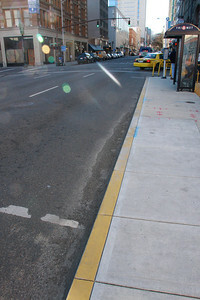 It doesn’t do anyone any good to have these streets whimsically destroyed like this because they’re just built crappy. Often politicians get road funding but then just make sure they get votes for the projects but don’t build the infrastructure for the long term. That type of nonsense has to stop. It also brings up the thought, why not really build up the arterials (this is where the pro-bus and anti-rail people and I disagree) that have over 10k-12k riders. 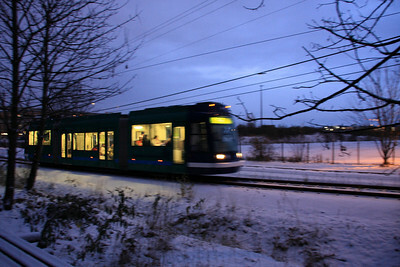 Routes like Powell, Belmont, and Hawthorne should have higher capacity rail options such as light rail or streets (multi-unit). Rail infrastructure obviously lasts longer than any type of utilized road infrastructure out there, yes at a higher cost, but the costs start to drop once you pay the capital and then inflation makes the price plummet. Rail that costs a few hundred grand in 1960 is still used today in some cities. Rail dropped in San Francisco in the 80s and 90s for half of what it would cost now is only at about 1/3 of its lifespan. Between our monetary inflation system and the lifespan of rail, it easily becomes the cheapest option for high throughput long term right of way. It needs viewed as such and utilized more.